Pittosporum eugenioides variegata Lemonwood is used as a screening plant. Will reach 6m however can be trimmed to create a more formal hedge. Heat and drought tolerant. Small yellow flowers in spring to summer. 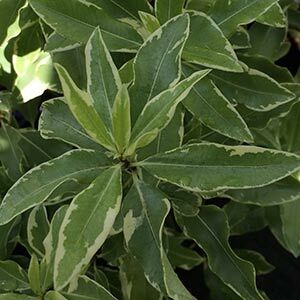 From New Zealand where the common name is ‘Tarata’ the species has foliage with tight undulations on the edge which add to the overall appearance. Creamy white flowers in summer are lightly perfumed and attract bees and butterflies to the garden. When first planted Pittosporum eugenioides will have a fairly upright conical habit, as it mature it will form a more rounded crown. This non native plant has attractive foliage and is regarded as reasonably drought tolerant. Used as a screening plant, or a background plant in the border. Also suited as a small feature tree in tough conditions. Tolerates a range of soil conditions as long as drainage is good. Fertilise with general purpose slow release type fertiliser in spring.